Struggle stalwart Mama Sisulu remembered for her immense contribution to the emancipation of South Africans. 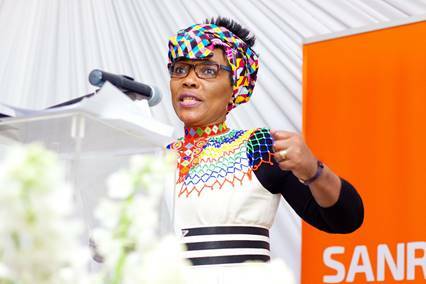 Deputy Minister of Transport, Sindisiwe Chikungu, delivered the keynote address at SANRAL’s fifth annual Women’s Month seminar held in Queenstown. The South African National Roads Agency (SOC) Limited (SANRAL) recently honoured struggle stalwart Mama Albertina Nontsikelelo Sisulu at the fifth annual Women’s Month seminar in Queenstown at the Roydon Nature Reserve. The seminar was held to observe Mama Sisulu’s centenary year and to honour her legacy. The event was dedicated to her immense contribution to the emancipation of South Africans in general, and women in particular. Mama Sisulu’s grandson, Vuyolwethu Sisulu, said the family appreciated the gesture by SANRAL to honour his grandmother. “She was blessed with many grandchildren but had the wisdom of making each one of us feel special, like we were all her favourites. She taught us about the importance of hard work and earning one’s way, rather than expecting privileges that come with the Sisulu name,” he said. Speaking at the event, Deputy Minister of Transport Sindisiwe Chikungu, said: “Through her leadership she dedicated her home to emancipate all our people. She was central to the emancipation of women. Today we are in the birth province of this liberation icon, this revolutionary. Chikungu said that SANRAL was changing for the better in terms of empowerment of women and black people. “I congratulate SANRAL. When we speak about our road network in South Africa, these are the best roads that we have in the country. We are number 18 in the world in terms of quality of road and number 10 in the world in terms of route kilometres. Our roads are the best,” Chikungu said. Eastern Cape-based entrepreneur Lungiswa Moko told guests “women are governing, both in the workplace and in our homes. “I am a registered professional construction project manager. My job is a very difficult job. I sit at the head of the table, heading meetings attended mainly by men and tell them where to go,” Moko said. SANRAL has held Women’s Month seminars over the past four years and has seen a growth from around 60 guests in 2014 to more than 150 this year. This year’s theme was “Beyond Inclusion” and was aimed at tackling the challenges that women face when it comes to inclusion, ensuring that women are not just included economically and politically, but that they become equal partners with men in the industries SANRAL operates in. The seminar took place in the form of a moderated panel discussion with focus on issues such as the role of women in advancing themselves and other women; the role of men in advancing women; the role of business and government in ensuring more women have access to opportunities; as well as the inclusion of women in the construction industry through SANRAL’s new Transformation Policy. Panellist, Bruce Ndlela, the Public Affairs Director at Bell Equipment, said they had signed an MOU with SANRAL to ensure that women in construction gain access to equipment as this was one of the main barriers to access. “Women, if you don’t ask and demand, it is not going to happen. You have to sit us down and take us through your demands,” he advised. SANRAL has a good story to tell when it comes to gender equality and empowerment. In the 2014/15 financial year, SANRAL spent R2.9-billion nationally on contracts with small businesses and 4 064 people were trained in aspects of road building, of whom 694 were women. In the 2015/16 financial year, SANRAL spent R3.56-billion on contracts with Small Medium to Micro Enterprises (SMMEs), R1.9-billion of which was earned by 1 004 black-owned enterprises. The agency trained 4 120 people (including 1 531 women) in road-building and other skills through 6 237 courses at an investment of R12.9-million. During the 2016/17 financial year SANRAL awarded 172 contracts worth R16-billion for new works, rehabilitation and road maintenance projects. SMMEs earned a total of R4-billion through contracts with SANRAL, in addition, the roads agency trained 4 257 people (including 1 690 women) in road-building and other skills through 8 604 courses at a cost of R16.9-million. Mulder said: “The agency’s commitment to promote the growth of small and medium-sized businesses, which reduces unemployment and helps build a skilled workforce, is reflected in the growing value of contracts allocated to black-owned companies, and enterprises owned by women and the youth.